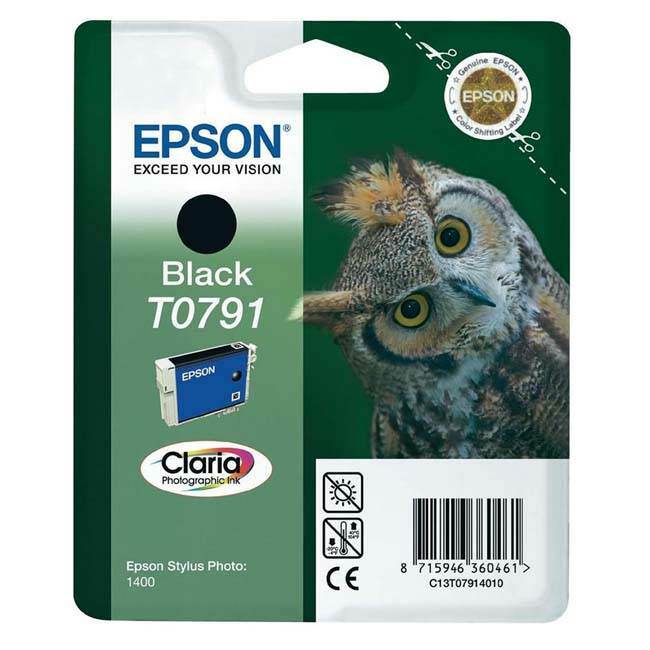 This Epson T0791 Black cartridge is part of Epson's Owl Series of inks. Designed to work in a wide range of Epson 6 Cartridge Printers, such as the Photo 1400, the C13T07914010 cartridges are produced to combine an ideal cross between office and photo printing. The Epson T0791 Black cartridge contains 11.0ml of ink, making it ideal for office and home use. The Black T0791 contains Epson's Claria Hi-Definition Ink, a dye-based ink, the Claria ink within the T0791 cartridge has been designed to print excellent quality images, lasting for the long term, whilst being resistant to smudging and fading. The C13T07914010 cartridge is therefore ideal for printing important documents with fantastic definition and is also perfect to go with the other 5 colour cartridges in producing quality photo printing. Our Original Epson T0791 Black Cartridges for this range of Epson Printers are amongst the lowest priced on the Internet. All our prices include VAT and delivery so the price you see is the price you pay.